Posted May 11, 2018 by Eds. 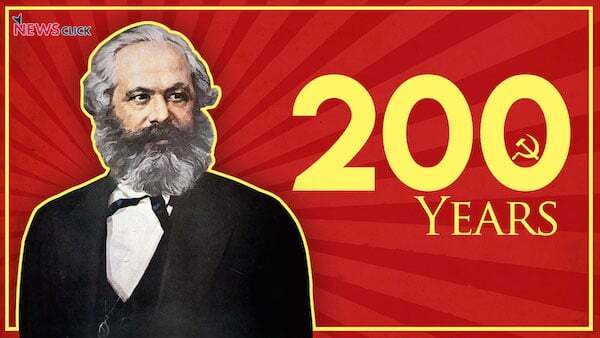 This is the bicentenary year of the birth of Karl Marx; and the best way of observing it is to recall the teachings of that great man—and act according to them. A basic part of his thought was his conception of History; and for us in India, as for other people throughout the world, this is of living importance — a guide to how we should draw lessons from the entire past experience of mankind, and how, understanding the trend of movement of human societies, we should strive to shape our future. Eminent modern theorists of History have often affirmed what Marx too would have fully approved of. With E.H. Carr he would have insisted that “historical facts” can be grasped; and that one perfects one’s knowledge of the past through exploration, selection and interpretation of such facts. He would have equally approved of Marc Bloch’s justification of History by the use to which it can be put: it is not an art-for-itself, but a branch of knowledge by which we assess our actual experiences so as to help chart our future action. Marx had said as early as 1845: “The philosophers have only interpreted the world in various ways; the point is to change it” (Theses on Feuerbach). It is above all to help frame our action and our practice today, that we study History, which is essentially a record of the past circumstances and our past practice. There are two ways of dealing with History. One is merely to dole out a record of events, preferably political or cultural events, as writers of the past might have happened to describe them. This would mean that our assessment of the past in its various epochs is only through the spectacles of our precursors, who lived in totally different social and intellectual environments. Their understanding of the circumstances of their day could be of only limited use to us today. This is often stressed by professional historians when they reject “qualitative” statements by their sources. Marx too made the same point when he said: “Just as one does not judge an individual by what he thinks about himself, so one cannot judge such a period of transformation by its own consciousness” (Preface to The Critique of Political Economy). The second way, then, is to combine the results of a generalised universal interpretation of human history with the description of a specific period or aspect of history of a country or region. The constant interaction of the universal with the specific will help to give us an understanding which was denied to historians of earlier periods, even to one as comprehensive in his search for information as Herodotus (5th century BC, Greece) or of as acute a mind as Ibn Khaldun (14th century, North Africa). Indeed, as History itself lengthens with the passage of time, the universal experience which defines our general interpretation becomes richer; and this must continually affect the interpretation of all histories of particular countries in specific periods. Marx’s view of history is an abstraction from the universal experience, so far as it was known to him. Coming after the first modern scientific explorations of the past, and its syntheses by modern philosophers, notably Hegel, Marx’s abstraction is very strongly based on factual information, and forms a very well integrated frame-work for studying all history. In the first place, Marx regards the striving for the fulfilment of man’s material wants as the basic aspect of the functioning of human social formations. These wants are met by production, which can only take place when men and women live in societies. “The mode of production of material life”, says Marx, “conditions the general process of social, political and intellectual life” (Preface to Critique of Political Economy). This concept is basic in Marx; it is why his entire view of History is known as Historical Materialism, in contradiction to the view of idealist philosophers, to whom History appeared as the unfolding of the Idea, or Divine ordinances, or, at a more vulgar level, of an innate religious or national genius. the history of all hitherto existing society has been the history of class-struggles – (Marx and Engels, Communist Manifesto). If class-struggle has been the running thread of the history of all surplus – producing societies, these societies as well as the classes composing them have always been undergoing change. Marx held that the only unchanging law is that everything changes. This being so, cumulative changes have led to wholesale transformations, so that human history appears as a succession of separate “social formations”. Each social formation rests on how production is organised, and how the producer is constrained to part with the surplus. This basis of the social order Marx called “relations of production”, which, in turn, had its boundaries defined by “the means of production”, i.e. the tools and techniques in vogue at the time. Looking at Europe Marx distinguished the ancient or classical social formation resting on slavery, which was followed by the feudal, based on serfdom. Finally, there was the bourgeois or capitalist mode of production, based on wage-labour, itself made possible by the factory system. Capitalism, though arising in Europe, by its very nature tended to become a world-wide system. This represented the last exploitative social formation which it must be our aim to replace with Socialism, a system free of all class exploitation. mankind thus inevitably sets itself only such tasks as it is able to solve, since closer examination will always show that the problem itself arises only when the material conditions for its solution are already present, or, at least, in the course of formation. In other words, the realm of consciousness is limited by the material possibilities existing at the time. But there are other limitations as well; and past societies have failed to achieve a complete rational vision of themselves. Thus persons belonging to particular classes, e.g. peasants, may fail to see themselves as members of the particular class, to which they may actually belong. Religion has often played a part in obscuring such rational perceptions. Marx accordingly had very early called religion “the opium of the people”. Similarly, human action taken under the impulse of an irrational consciousness may still help to determine the complexion of social structure if material circumstances are present. We can cite the Indian caste system, as an example. It was built up under continuous religious sanction; the divisions into castes being denounced by Marx himself as “those decisive impediments to Indian progress and Indian power”. On the other hand, as Marx himself recognised, the rise of Protestant Christianity in modern times has played “an important part in the genesis of capital” (Capital, Vol. I). Thus the religious world being really “the reflex of the real world” (Marx) may affect deeply the complexion of the real world. All fixed, fast-frozen relations with their train of ancient and venerable prejudices and opinions, are swept away, all new-formed ones become antiquated before they can ossify. All that is solid melts into air, all that is holy is profaned; and man is at last compelled to face with sober senses his real conditions of life and his relations with his kind – (Marx and Engels, Communist Manifesto). Such liberation of consciousness is related to the possibilities created by material factors — machinery, modern technology, economies of scale — for the overthrow of class-exploitation and the establishment of Socialism. Marxism, or Scientific Socialism, forms the apex of the liberated consciousness, and the working class (created under capitalism) is by its struggles, the harbinger of the coming new order. But the working class has to become conscious of itself, and of its historic role, before it can achieve what material circumstances have made possible for it. There can be no blind, spontaneous revolution. That is why, far from being a “determinist”, Marx emphasized the crucial role of ideas, and worked so hard to elaborate the most rigorous philosophical and economic theory, out of an extensive critique of contemporary bourgeois thought. The heritage he has left us is not only his splendid revolutionary theory, but also a methodology for following in his footsteps and analysing with equal rigour and vision our own past and present circumstances, and, developing on that basis, our “revolutionary practice”. All ‘conscious’ revolutionaries therefore, have a particular obligation to render: they have not only to absorb but also to spread the ideas that compose the revolutionary core of Marxism. If they fulfil this obligation, they will not only be learning from History, they will also be making it.